Can mimicking insect behavior provide a way to map the ocean floor? Can robotic-controlled flying and diving drones be both bird-like and fish-like in the race to explore the ocean depths? As a global group of 19 semi-finalist teams in the Shell Ocean Discovery XPRIZE compete to create innovative autonomous technologies to image and chart the unknown in a cold, dark and hull-crushing undersea world at depths down to 4,000 meters, we look to the innovation that will advance our understanding of our planet. In exploring the deep ocean, we’re seeing that new robotic approaches can open doors for capturing collective imagination more quickly than ever before – providing a detailed glimpse of deep landscapes, sunken artifacts and little-seen life forms...or even discovering new organisms or aquatic life. In this XPRIZE competition, teams are racing in a challenging timeline to take technology from concept to fully functioning system in 12 months. The goal? To enable high speed, high resolution mapping of a 500 square km2 area at a 2,000 meter depth in less than 16 hours. Teams moving on to the finals face mapping missions at 4,000 meter depths only 10 months later. On top of this, some teams are opting to compete to develop an underwater smart sniffer - the National Oceanic and Atmospheric Administration (NOAA) Bonus Prize to autonomously trace a chemical or biological signal to its source. The technological approaches vary. There is typically a heavy Artificial Intelligence (AI) component in the overall solutions to allow for deep ocean decision making and undersea robot coordination for mapping. AI is also critical in the underwater smart sniffer, as the solution detects a signal and decides which direction it is coming from. Each team has taken a different approach in facing the challenge of how to address the primary goal and where to start. As one team mentioned recently, nature has been designing things a lot longer than we have, and has always been a good place for inspiration to solve engineering problems. Nature can be an innovative thought-starter, and more than one semifinalist team in the Shell Ocean Discovery XPRIZE is developing solutions that will feature biomimicry behaviors to build intelligent swarms, hives, and heavy lift drone solutions that that can fly back and forth from the deep ocean competition mapping site. To compete in the Shell Ocean Discovery XPRIZE, the France-based Eauligo team has taken its inspiration from nature and plans to launch a horde of miniature robotic submarines that will mimic bee behavior. Watching bees going from flower to flower in a garden, the team leader observed each bee exploring on its own, and noticed that a large number of bees working simultaneously could cover a sizable area quickly. Transferring bee actions from garden to undersea, the Eauligo team is building swarms comprised of robotic “Marine Bees” and surface “hives” to explore and image the ocean floor. Just as the real bees leave their hive and fly looking for flowers then returning to tell the hive what they have found, Eauligo's Marine Bee submarines follow the same pattern. The Marine Bees dive down to the bottom of the ocean floor, spreading out to explore and map an area. They bring back their “nectar,” which in this case are data and images. Returning to the surface they share the data with the other Marine Bees so they can autonomously decide where to explore next. The design of each Marine Bee is also unique, using components and manufacturing techniques from mass-produced consumer products to drive down costs and create a low-cost unit. They have many features of full-sized Autonomous Underwater Vehicles but are smaller and cheaper. The real advantage comes from putting hundreds of these small and simple robotic submarines together. Multiple Marine Bees provide scalable and low-cost ocean discovery. As the ocean floor is unknown and unpredictable, it is impossible to program an autonomous vehicle to handle all conditions. However with Eauligo's solution if one of the Marine Bees fails to complete the task, they still have the results from the others, which provides a robust alternative to large, single vehicles. Continuing the analogy further, the Marine Bees operate from hives, which in this case are autonomous surface ships that manage a cell of the autonomous craft. A hive will carry the Marine Bees out to sea, launch them into the ocean and retrieve them after the dive. Mission control will communicate with the hive from shore, and the hive will communicate with the Marine Bees. The Blue Devil Engineering team based out of Duke University is using drones, drop pods and machine learning to map the seafloor. Led by Professors Martin Brooke, Tyler Bletsch and Douglas Nowacek, the team is an enthusiastic group of high school, undergraduate, and graduate students working together to develop their solution in classes and in their free time. Their solution involves mapping the target area using a more than 100-element grid of water columns, in which each column is being mapped using a lightweight SONAR pod. The pod will be dropped into the ocean from a heavy lift drone into the center of the column and will then collect SONAR data for the column as it descends. Once it reaches the bottom, the pod ascends to the surface to be picked up by the drone while transmitting the collected information. The drone then drops the pod to another location to start the process again. The SONAR data will be processed as it is obtained via cloud-based servers to generate a bathymetry map. Prototypes of its heavy lift drone have been tested in North Carolina’s Duke Forest, and the team has been using the ocean off of the North Carolina coast to test pod prototypes to 2,000 meter depth for Round 1 of the contest. It’s truly a team effort: undergraduate students are working on mapping algorithms in a Duke Data+ Summer Program and they are hosting 12 high school students with robotics experience to help with their final build. In the fall of 2017, about 40 undergraduate and graduate students will work on the project, deploying for Round 1 and prototyping for Round 2 of the contest. The heavy lift drone uses 18 rotors and can lift 90 pounds. The team is developing hybrid gas-electric generators to provide the 18 kW of power the drone needs at full thrust which will allow for several hours of flight time over ocean waters. 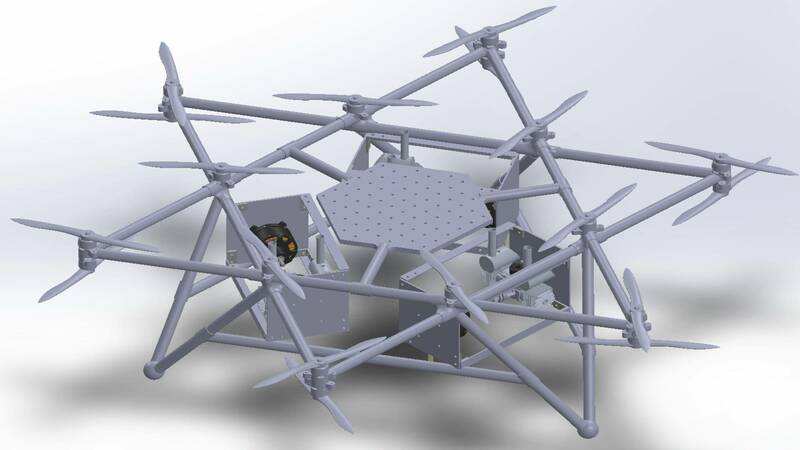 The drone is built from 3-D printed parts and carbon fiber tubes -- getting the 3-D printed parts to withstand the strains of flight has been a challenge for the team’s mechanical engineering students, but they have succeeded. 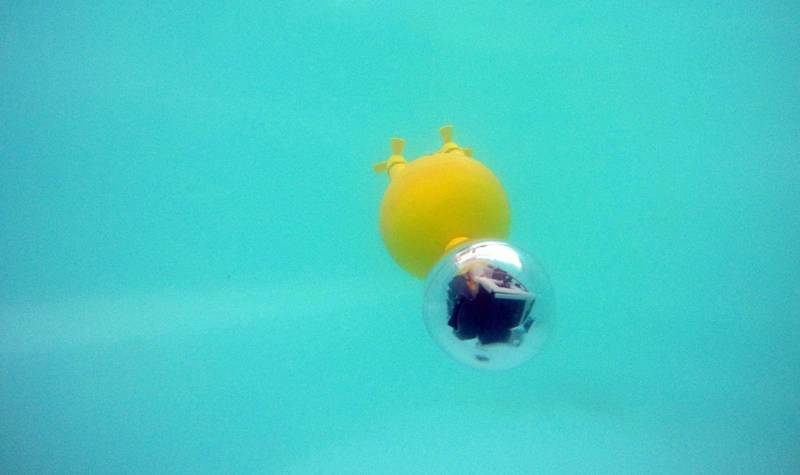 The lightweight diving SONAR pod uses low-cost, Raspberry Pi-based electronics encased in epoxy-filled 3D printed shells to achieve a system capable of surviving 2,000 meters for Round 1. Electronics component operations have been tested at depths in both a pressure chamber at Duke and at sea beyond the continental shelf off the North Carolina coast. The algorithms for reconstructing maps from the diving pod SONAR data are being designed with Synthetic Aperture SONAR techniques like back projection and machine learning using Bellhop simulations of the SONAR reflections. Their SONAR systems operation, as the pod descends, is different enough from most published SONAR mapping applications to require the team to innovate to achieve success. 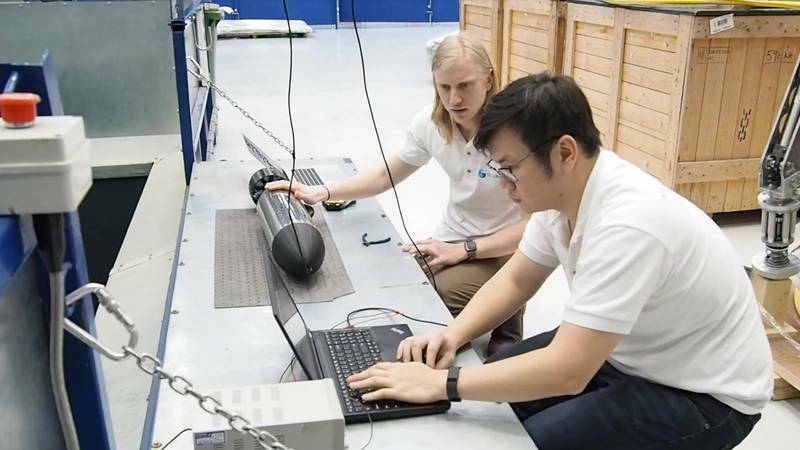 Team Tao brings together industry experts from UK subsea engineering specialist Soil Machine Dynamics Ltd. (SMD) and Newcastle University who together are developing an autonomous swarm system for rapid surface to deep ocean exploration. Beyond this small core team, there is an extended team of six technical consultants, a group of student engineers and a panel of six academic and industry advisors. Their approach to the Shell Ocean Discovery XPRIZE involves international collaboration through partnerships with companies and institutes in the United Kingdom, China and the U.S.
Dale Wakeham, Team Tao’s lead and an R&D engineer at SMD, originally put forward the idea of competing in the XPRIZE challenge to SMD’s CTO, Chris Wilkinson in early 2016. By August of that year they were in China brainstorming concepts with their parent company, CRRC Times Electric. Wakeham explains that in the UK and China both were speaking to a wide range of industry experts but were unable to find any market solutions that were anywhere near the capabilities that XPRIZE required, so they came to the conclusion that they needed to come up with an entirely new survey method. Wakeham remembers seeing a documentary showing that fire ants are individually unable to swim, but as a colony they can cross water. From the shore they start walking over each other to form a living raft and eventually bridge the water. The relatively simple ant forms part of a complex system that is able to complete an otherwise unachievable goal. Wakeham sees this solution as extremely scalable: the more ants there are, the larger the body of water they can cross but, if one ant becomes detached or lost, the mechanism still continues to function. That was the light bulb moment when Wakeham knew Team Tao’s swarm needed to share these principles. 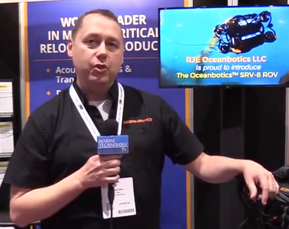 Conventional industrial autonomous underwater vehicle (AUV) systems involve an AUV deployed from a large manned vessel. The AUVs typically follow a ‘lawn mower’ path, scanning until their batteries are low, where the AUV would then resurface for recharging and the download of its data. Team Tao, dissatisfied with the costs, size, and rate of scan of these systems, set out to create a compact and cost-effective autonomous platform that can rapidly sense and survey the oceans. The system uses two main components: the BEMs (Bathypelagic Excursion Module), a swarm of around 20 vertically swimming AUVs and the autonomous surface vessel (ASV), a ‘vending machine’ style ASV that is responsible for horizontal transport, data handling and communications. A drone also provides air support. Hua-Khee Chan, a research associate at Newcastle University’s School of Electrical & Electronic Engineering and Team Tao core team member, sees benefits to the swarm approach, which allows a cyclic, continual operation without any system downtime and saves considerable amounts of time and money. One of the benefits of making the swarm travel vertically instead of horizontally, according to Chan, allows the team to leave out a lot of complex technology because dive time isn’t as long – meaning they can go with smaller batteries, cheaper technologies and consumer-grade electronics. Newcastle University also has a long history of creating sensors and Team Tao is using this knowledge to its fullest potential to drive down the costs of typically expensive subsea electronics. Currently in the final stages of in-tank tests, Team Tao is readying system operations in open waters. There is a wealth of wonder, history and mystery that await in deep sea regions that are thousands of meters under the ocean surface. As we look toward hardware and software technologists who are creating innovative solutions to go untethered near the sea floor, we applaud the new breed of ocean explorers who ask the same big picture questions that loom from the farthest reaches of space to the dark unknown details of the ocean depths. What new surprises will we find once we get there? Will there be new forms of life we’ve not seen? Can any of our discoveries be used to better mankind? Innovation in exploration is key to unlocking the unknown both on our planet and beyond. We look forward to the quest of each of our exceptional teams to help us further understand the discoveries, unlock the mysteries and be a part of the wonderment awaiting us all. Dr. Jyotika Virmani is Senior Director for Planet & Environment at XPRIZE and prize lead for the Shell Ocean Discovery XPRIZE. Dr. Virmani has over a decade of professional experience in oceanography. She has a Ph.D. in physical oceanography.